Creating a basic SPF Record in WHM ? 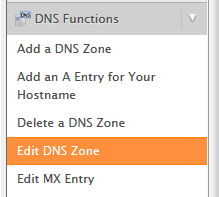 Look to the left sidebar menu,locate the DNS Functions category and click on Edit DNS Zone. To the right is a list of the domains on your hosting account. Highlight the domain name you want to create the SPF record for and click the Edit button. The DNS Zone editor page will appear. Scroll to the bottom of the screen and create your SPF record using the form under Add New Entries Below this Line. There are four separate sections. Enter the domain name to add a period (.) at the end of the domain name. This is the time in seconds the record exists before checking for updates. Leaving it at 14400 seconds (4 hours) is recommended. SPF records always need to be a type of TXT. Here enter the actual SPF record within the quotation marks. After entering the information for your SPF record, click on the Save button at the bottom of the page. This will activate your new SPF record for your domain.